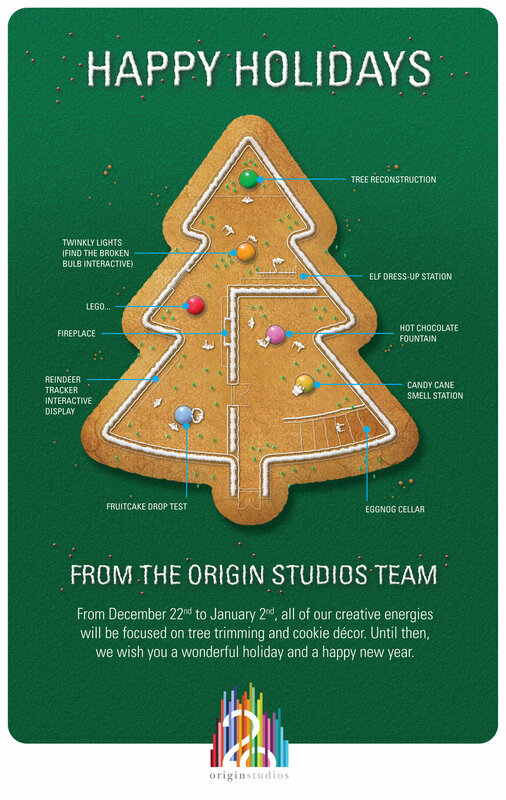 Happy Holidays from Origin Studios! Splash page for website features a half dozen different backgrounds on an automatic slideshow. 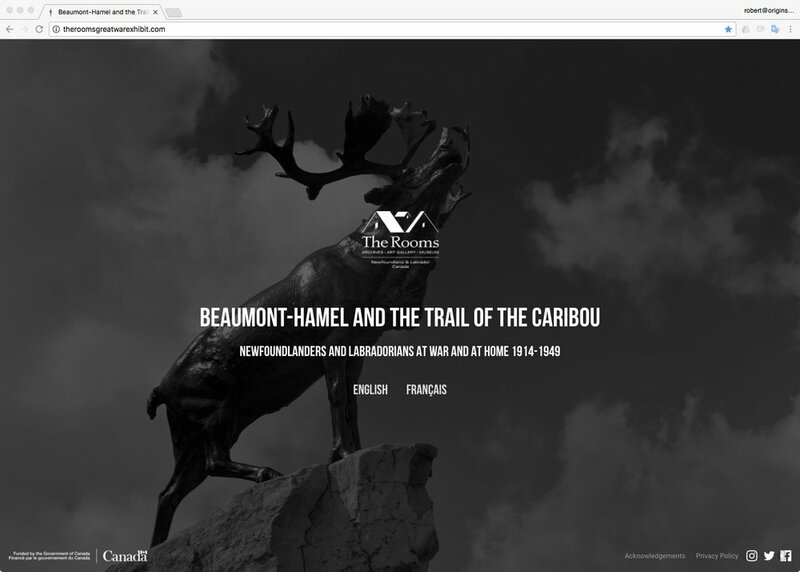 Origin Studios and media partner Orange Sprocket have created a virtual exhibit for "Beaumont-Hamel and the Trail of the Caribou" that extends and complements the exhibit in The Rooms' Royal Newfoundland Regiment Gallery. We didn't want to make just another page-turner website – essentially a book on the web – but rather we wanted to create something that rewards visitor exploration. We also wanted something that used the visual design language of the actual exhibition, which we designed (check out the project here). The grid pattern of the graphics in the physical exhibit was repeated in the virtual exhibit. The result is a website that encourages exploration through the juxtaposition of images and artifacts. The website, which is organized more or less like the actual exhibit, relies heavily on images to attract and move visitors through the site. Large and small images, blocks of text on coloured backgrounds, and media features populate horizontally scrolling sections. Visitors can peruse the virtual exhibit much like they would walk through the real exhibit. They can stop and click on every photo, every artifact, and every text block to find out the who, what, where, when, and sometimes why. They can scroll through the site clicking on what catches their eye, selectively engaging with content based on their interests. Or, they can just skim the exhibit, taking in images and text as they scroll by. Visitors are presented can click every block for more information, click on just what interests them, or simply scroll through the website. Origin Studios is pleased to announce that we are starting the second phase of exhibit design on the Halifax Citadel’s new Heritage Centre, which will tell the histories of the four citadels that have stood on the historic site since 1749. The new exhibition space will replace the Tides of History theatre with an engaging and interactive space featuring digital interactives, audio visual media, immersive spaces, and artifacts. Origin Studios and its exhibition development and fabrication partners, Lord Cultural Resources, NGX Interactive, and Kubik, are collaborating with Parks Canada to plan, design, and build this exciting new addition to Halifax Citadel National Historic Site. Origin Studios is pleased to offer its congratulations to The Rooms on the opening of their important new exhibition “Beaumont-Hamel and the Trail of the Caribou” in the new Royal Newfoundland Regiment Gallery. It is the culmination of years of hard work by The Rooms staff collecting stories and artifacts from throughout the province to tell the First World War stories, both overseas and on the home front, of Newfoundlanders and Labradorians. Origin Studios is pleased to have had the opportunity to work (again!) with The Rooms’ talented and dedicated staff on this project, and we encourage everyone who finds themselves in St. John’s to go see this amazing exhibition. The exhibition features the faces and voices of the people of Newfoundland and Labrador. “Royal Newfoundland Regiment Gallery,” The Rooms. Origin Studios is pleased to announce a new project with the Dawson City Museum in Yukon Territory. The museum is renewing their permanent exhibition to get more of their collection on the gallery floor and provide more interpretation for their wonderfully varied artifacts. Origin is providing interpretation and exhibit design services, and also redesigning the museum staff’s office space. Origin Studios’ meeting with the museum’s exhibit development team in early February was a great success. As we discovered on this trip, the Gold Rush looms large in the town’s landscape, but it is ultimately dwarfed by the land itself. There are many interesting and important stories in the Klondike and we look forward to working with the Dawson City Museum to tell them to their visitors. And we also look forward to returning to this historic and beautiful corner of Canada later this year to experience the midnight sun! The Dawson City Museum with the Midnight Dome, illuminated by the setting sun, in the background.